Québécois is the name for the official language of Québec. (The word Québécois also is used to describe things that hail from Québec.) Québécois, the language, is often falsely derided as "low class French." It differs in many ways from the French taught in classrooms as well as the French spoken in Europe. These differences, as well as Québec culture make Québec a unique location and Québécois a fascinating language unto itself. The Canadian province of Québec lies in the northeastern section of the country. 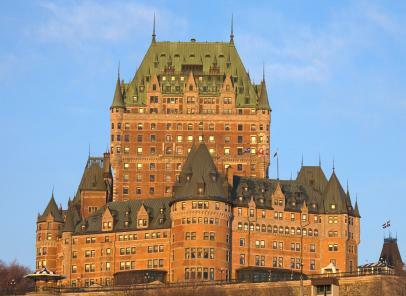 Its capital, Québec City, is a frequent tourist destination due to its lovely old quarter and charming buildings. Québec is unusual in that among all the Canadian provinces, French is the official language, and in particular, the French dialect called Québécois. According to a 2006 census report, 95% of people living in Québec speak French as their first, second or third language. Québécois derives from early modern French. During the early days of Canadian colonization, many settlers arrived from France. These people spoke an early version of modern French, which became the dominant language. As they settled the area, they picked up words from both the Native Americans living in the area as well as their English neighbors. Words for local places and geographic features, such as mountains and rivers, were adopted from the various Indian dialects. As time went on, the language evolved into a more informal French, easily adapting words from English and other languages into the main dialect. One of the interesting things about Québec French are the many references to rivers, streams, and water-travel that infuse the language. Many rivers intersect the Québec province, and travel by water was an important way for people to trade and colonize. An example of this are the verbs used to describe someone getting into or out of a car. In modern French, the verbs monter and déscendre are used to describe entering or exiting a car. In Québécois, embarquer and debarquer as used instead. These are words normally used only to describe getting into and out of a boat. There are many more differences in vocabulary. A Québécois dictionary online may be found at The Free Dictionary to look up particular words and phrases of interest. In past decades, many European French people looked down on Québec French as a poor example of the French language. The inclusion of Native American and English words was viewed with skepticism. Québec French also tends towards informal, colloquial speech, while European French tends more towards the formal. Québec French has its own version of formal and informal language. While the formal version is easily understood by anyone speaking French, the informal language drops pronouns, omits the negative - ne, and changes other things in syntax, vocabulary, and pronunciation. That's why Québec television shows often include subtitles when shown on French-language channels outside of Canada. Characters speaking to one another use informal Québécois, which is hard for anyone other than a native speaker to follow. While Québec residents can usually watch a movie from France and understand the dialogue without subtitles, the opposite probably doesn't hold true. Another hallmark of Québécois is its flexibility. Québec French speaking people are much more likely to embrace and use words from other languages. This comes partly from the New World mentality of welcoming immigrants from all lands and cultures. As immigrants came to Québec and learned the language, they added their own colorful words. Words like pizza became commonplace. The language also absorbed many Native American words early in its history. In fact, Canada and Québec actually come from the native Indian tribes or First Nations. If you're visiting Québec and want to try your French, residents should have no problem understanding you, since most can easily understand modern French. Some vocabulary words are different, so you may have to try a few times before you hit upon a phrase the other person understands. The language may sound like slurred French to you, with the accent making some words seem to flow together in ways different from the crisper Parisian accent. Since most Québec residents also speak fluent English, you should have no trouble making reservations or ordering "le pizza" at the restaurant!